The United States produced more petroleum liquids and natural gas than any other nation in 2015, federal energy data show. Even as low oil prices forced companies to delay drilling and postpone projects, U.S. producers still churned up more total hydrocarbons than Russia or Saudi Arabia last year. U.S. petroleum supply increased by 1 million barrels a day to 15 million barrels a day in 2015, the U.S. Energy Information Administration reported Monday. U.S. natural gas production rose by 3.7 billion cubic feet per day last year to 74.2 billion cubic units, with most of the surge coming from the Eastern states. Overall, U.S. production of petroleum liquids and natural gas reached an estimated 58.3 quadrillion British thermal units in 2015, said Linda Doman, an EIA analyst in Washington. America’s energy production has soared in recent years, thanks primarily to new discoveries and developments across shale formations. Technological advances in horizontal drilling and hydraulic fracturing, or fracking, have enabled producers to crack open tight rock formations and unleash reserves of crude oil and natural gas. Long-term, high-cost projects in the Gulf of Mexico and Alaska have also starting adding large volumes of hydrocarbons to the U.S. energy mix. 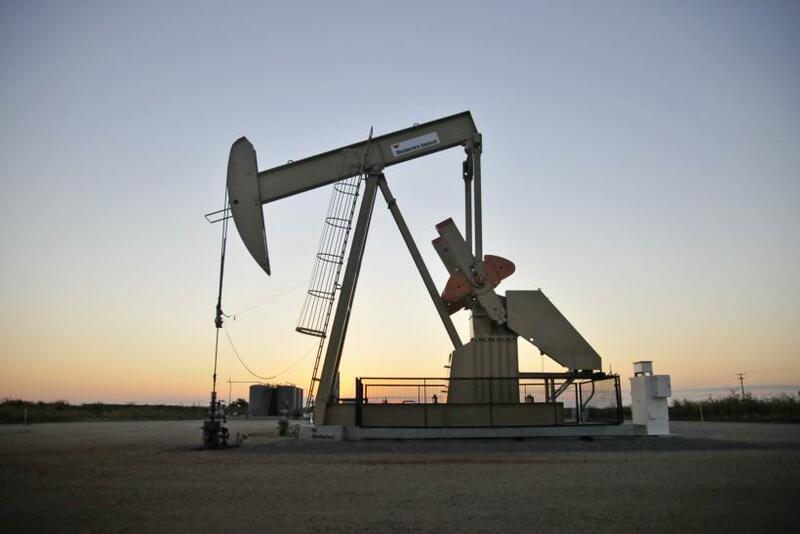 U.S. oil and gas supplies rose last year despite the industry downturn. Oil prices plunged by as much as two-thirds earlier this year from June 2014 highs as crude supplies outstripped global demand. Dozens of companies filed for bankruptcy and canceled billions of dollars in exploration and production investments. Yet cheaper, more efficient drilling technologies and operations enabled many U.S. drillers to keep tapping wells at a lower price. The U.S. first overtook Russia as the world’s top producer of both petroleum and natural gas in 2012. America has been the biggest natural gas producer in the world since 2011 and the largest producer of petroleum hydrocarbons since 2013, according to the EIA. Russia boosted its oil output to near-record levels earlier this year as the state-run energy company sought to offset declining revenues caused by lower prices. Yet Russia’s natural gas production declined overall as poor economic conditions and a mild winter dampened demand. The nation’s total hydrocarbon output was nearly flat last year compared to 2014, the EIA said. Saudi Arabia similarly ramped up crude production in 2015 to near-record levels. Yet the oil-rich kingdom produces substantially less natural gas than the United States or Russia. 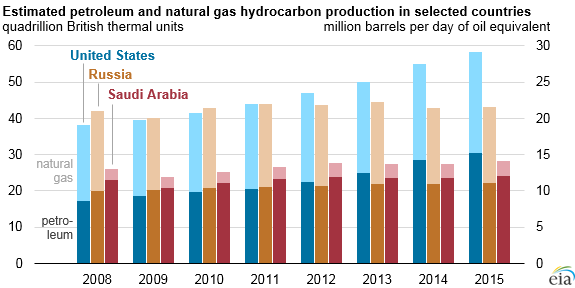 As a result, the U.S. produced more than twice the total crude and gas hydrocarbons than Saudi Arabia last year. U.S. crude production isn’t immune to falling oil prices, however. Petroleum and other liquid fuels production is expected to drop by more than 3 percent to about 14.5 million barrels a day in 2016 and 2017, the EIA estimated.